On January 14, 2011, President Zine el Abidine Ben Ali fled Tunisia after 23 years in power. He was the first Arab head of state in recent history to be removed by a popular uprising. The events leading up to his overthrow were scantily reported in the mainstream international media, though I followed them regularly on my blog. I have compiled all my blog posts below, together with a couple of articles I wrote for the Guardian's Comment Is Free website, in chronological order. 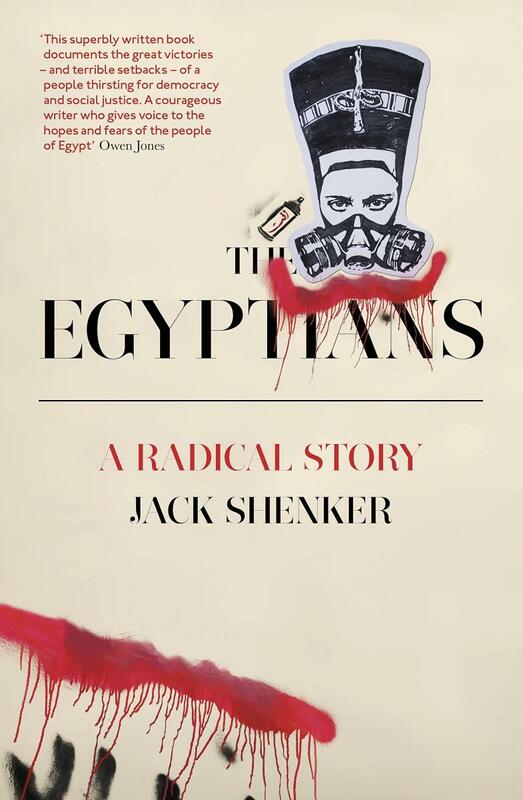 Together, they provide a comprehensive picture of what happened during the Tunisian revolution. "The matter has to do with a procedure carried out by the city of Sidi Bouzid’s municipal regulations services, as part of their ordinary monitoring operations, by notifying a street vendor who was carrying out his activities in an area unauthorised to this effect. The concerned services reminded the citizen to move away his activity elsewhere. "The vendor refused to comply with the rules and insisted on remaining on the spot. And, when the municipal agents enforced the law, the vendor doggedly stuck to his refusal and attempted to his life by setting fire to himself." The vendor in question was Mohamed Bouazizi, a 26-year-old university graduate who had been unable to find a job. He set himself on fire last Saturday when police confiscated the fruit and vegetables he was selling on a stall without a licence. He is now critically ill in hospital with third-degree burns. Rioting followed – an unusual occurrence in Ben Ali's police state – and continued into Sunday with police firing tear gas to disperse the crowds. A number of videos have been posted on YouTube recording the scenes, though journalists have been prevented from entering the town. On Wednesday, another unemployed man in Sidi Bouzid, 24-year-old Hussein Nagi Felhi, reportedly announced that he was going to end his life. He climbed a high-voltage electricity pole, shouted "no for misery, no for unemployment" and touched the wires. The suicide angered young protesters, who hurled stones at police and were met by volleys of tear gas. Protesters in a nearby town set an administrative building on fire, said Mohamed Ben Fadhel, a local leader of a teachers' union. A teenage protester was shot dead by police yesterday as rioting continued in Tunisia. Demonstrators in Menzel Bouzaiene reportedly set fire to three police cars, a train locomotive, the local headquarters of the ruling Constitutional Democratic Rally party and a national guard post. The interior ministry said police shot "in self-defence" after being attacked with Molotov cocktails. The dead youth was named as Mohamed Ammari, 18. Menzel Bouzaiene is about 70km south of Sidi Bouzid where there were riots after a young unemployed man set fire to himself last Saturday. On Wednesday, another unemployed man committed suicide in Sidi Bouzid by climbing an electricity pole and touching the wires. Menzel Bouzaiene is now said to be sealed off, with no one allowed in or out, so it is difficult to be sure exactly what is going on. Nevertheless, some information is leaking out via the internet. A video shows the burning police station (national guard post) and there's a photo purportedly showing a youngster who was tortured in Menzel Bouzaiene. 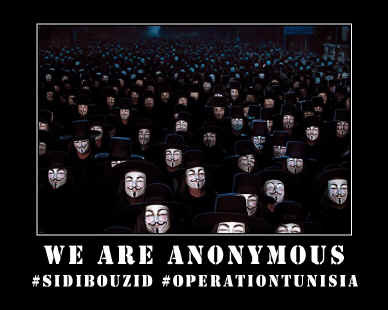 Other information can be found on Twitter (#sidibouzid). The Moor Next Door blog discusses the situation in Tunisia and nawaat.org has a compilation of media coverage since the trouble began. The big question is what effect – if any – this will have on the police state run by 74-year-old President Ben Ali. It has reacted, predictably enough, with a security clampdown and lots of arrests. On Thursday, the development minister also travelled to Sidi Bouzid and promised a $10m employment programme. Whether the regime fully appreciates the potential scale of its problem, though, is another matter. In a system where people can't speak freely and fawning to the president is the order of the day, it's very difficult to examine the underlying issues objectively and address them properly.
" ... extended warm thanks and high consideration to President Zine el Abidine Ben Ali for his commitment to lay the foundations of a comprehensive, fair and balanced development, as well as for the unflinching care he has constantly lavished on regions, as testified to it by the multitude of projects launched for the region’s benefit, the gains and achievements accomplished to hoist it to the rank of an active development pole." If the disturbances in and around Sidi Bouzid are successfully quelled, the regime may fail to heed the warning signs. It's not a local matter. Fifty-four per cent of Tunisians are under 30 and many of them are well educated but frustrated. Unemployment is officially running at around 13% – which probably means it's actually a good deal higher. Protests in Tunisia spread to the capital, Tunis, yesterday when human rights activists, trade unionists and students held a demonstration in the Place Mohamed Ali in solidarity with the people of Sid Bouzid. The nawaat.org website has videos and photographs. Meanwhile, it is reported (via Twitter) that the towns of Meknassi, Mezouna, Menzel Bouzian – all in the Sidi Bouzid governorate which has been the scene of disturbances during the past week – are under curfew, with joint police-army patrols. The protests are getting very little coverage in the mainstream media – one reason being the restrictions on journalists imposed by Ben Ali's regime, another being that the international news ogranisations are more or less on autopilot over the Christmas period, and so we're left mainly with information posted by individuals on the internet. Also, judged within the overall framework of news from the Middle East, the events in Tunisia may not look particularly dramatic: "only" two dead so far, and al-Arabiyya puts the number of participants in yesterday's Tunis demonstration in the hundreds rather than thousands (though it does say that 2,000 took part in the Menzel Bouzaiene riot on Friday). It's only when you view them in the context of Tunisia, a police state where such things are not supposed to happen at all, that the protests of the last week begin to look much more significant. If the regime isn't worried by them, it ought to be. Yesterday, nawaat.org reported (in French) that the director-general of the central bank had paid an urgent visit to the presidential palace and that the presidential plane was on standby, ready to fly the Ben Ali family out of the country. That may be wishful thinking on the part of nawaat's sources. However, it may not be entirely preposterous to suggest that the writing is on the wall for the Ben Ali regime, even if its end is still some way off. The first test is whether the events of the last week will succeed in breaking down the "fear barrier" among the Tunisian public. Is popular discontent about unemployment, corruption and many other things finally beginning to outweigh people's fear of the authorities? And if a small number are seen to have lost their fear, will others join them? It's possible, though by no means certain. The second, and perhaps more important test, is the reaction from those who help to maintain the regime's control: the security forces and government officials. Will they continue to accept the official line that President Ben Ali has constantly lavished "unfliching care" on his citizens and that "certain sides" are behind the troublemakers? Privately, among the lower ranks at least, they probably share many of the protesters' frustrations. How many of them have sons, daughters, brothers or sisters who are struggling to find a job? There's a story in the Qur'an – a sort of parable – about the ancient Marib dam in Yemen and how a mouse brought it down by dislodging a single stone, and in the process destroyed a civilisation. The trigger for the Tunisian riots was something equally small. Twenty-six-year-old Mohamed Bouazizi had a university degree but no work. To help out his family he took to selling fruit and vegetables in the street without a licence. When the authorities stopped him and confiscated his produce, he set himself on fire. El-Materi's house is spacious, and directly above and along the Hammamet public beach. The compound is large and well guarded by government security. It is close to the center of Hammamet, with a view of the fort and the southern part of the town. The house was recently renovated and includes an infinity pool and a terrace of perhaps 50 meters. While the house is done in a modern style (and largely white), there are ancient artifacts everywhere: Roman columns, frescoes and even a lion's head from which water pours into the pool. El Materi insisted the pieces are real. He hopes to move into his new (and palatial) house in Sidi Bou Said in eight to ten months. ... Most striking of all, however, was the opulence with which El Materi and Nesrine live. Their home in Hammamet was impressive, with the tiger adding to the impression of "over the top." Even more extravagant is their home still under construction in Sidi Bou Said. That residence, from its outward appearance, will be closer to a palace. It dominates the Sidi Bou Said skyline from some vantage points and has been the occasion of many private, critical comments. The opulence with which El Materi and Nesrine live and their behaviour make clear why they and other members of Ben Ali's family are disliked and even hated by some Tunisians. The excesses of the Ben Ali family are growing. Demonstrations continued in Tunisia over the weekend and have now entered their second week – an extraordinary development in Ben Ali's police state. Here is a YouTube video showing protests outside a government building in Kairouan, 120km north-west of Sid Bouzid, and here is another at an unidentified location. In both videos the protests appear to be nonviolent and police, probably outnumbered, can be seen standing by without intervening. However, a report by al-Ahram Online talks of "a campaign of night raids by security forces" and says that in the capital "security forces brutally attacked protesters to disperse from outside the Tunisian General Labour Union's HQ". The Algerian news website, Ennahar Online, says hundreds demonstrated over the weekend in Souk Jedid, 15 km south of Sidi Bouzid. "Men of the National Guard [fired] warning shots to disperse demonstrators who surrounded the position of the guard and set fire to the sub-prefecture of this city of more than 19,000 inhabitants," it says, citing a trade union source. A member of the National Guard was reportedly shot in the thigh by mistake. In Regueb, 37 km southeast of Sidi Bouzid, demonstrators clashed with police on Saturday evening and the disturbances continued through to the early hours of Sunday. "Youths claiming the right to work set fire to a bank to a court and destroyed a cafe belonging to a member of the ruling Democratic Constitutional Rally (RCD)," Ennahar says, again citing a trade union source. The clip includes an interview with Said Ferjani, of the outlawed Islamist Nahda movement, who touches on what may be the nub of the issue: not so much unemployment itself but the mismatch between the government's constant claims of economic progress and the experience of ordinary Tunisians. If things are really getting better, where is all the money going? What happens when money, coercion and blood ties become the potion of power? A "state" is born. Not "Tunis", that place of congeniality and conviviality as its Arabic name suggests. Rather, a different "Tunis", a Tunis which is run and owned by a club of rich and powerful families. That "Tunis" today conjures up a disturbing political triad. "Bin Ali Baba" is partly Papa Doc, partly Suharto reincarnate. Yesterday, AFP reported the suicide of another unemployed man. Lotfi Guadri, 34, is said to have thrown himself into a well in Gdéra, five kilometres from Sidi Bouzid. However, it's unclear to what extent his death should be linked to the current protests. A relative is quoted as saying he suffered from psychiatric problems and had been due to start work next month. 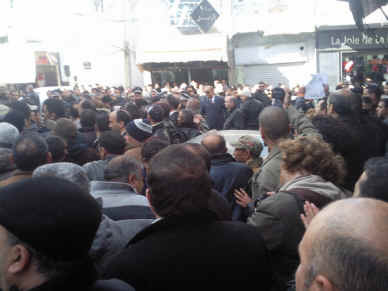 The riots and demonstrations that have swept through Tunisia during the past 10 days also began with a small incident. Twenty-six-year-old Mohamed Bouazizi, living in the provincial town of Sidi Bouzid, had a university degree but no work. * To earn some money he took to selling fruit and vegetables in the street without a licence. When the authorities stopped him and confiscated his produce, he was so angry that he set himself on fire. President Ben Ali has so far avoided that mistake and continues to be extolled by the official media. But there was a telling straw in the wind when his Constitutional Democratic Rally party called a meeting in Sidi Bouzid last week. "The meeting, which was supposed to deliver a strong political message and calm things down, was feeble," one journalist was quoted as saying. In the event, very few party members turned up. * In had been widely reported at the time that Bouazizi was a university graduate. However, his family later said that he had left school at 18. With the disturbances in Tunisia showing no sign of abating, President Ben Ali decided to address his people on television last night. But his seven-minute speech, also relayed to the wider Arab world via al-Jazeera, didn't go quite according to plan. Three minutes and 39 seconds into the broadcast, crisis turned to hilarity when his phone rang. Ben Ali didn't answer, and pressed on with his speech, looking slightly uncomfortable as the phone continued ringing. Within minutes of the broadcast ending, jokes about his mystery caller were circulating on Twitter. As for the speech itself (English transcript here), Ben Ali didn't really have anything to say. A smart politician, in a similar situation, would have offered some new initiative for dealing with it, but from Ben Ali there was nothing beyond what has already been announced. He talked vaguely about "sparing no efforts", and urged government officials to "avoid all shortcomings" and "shoulder their responsibilities". He expressed sympathy for the unemployed while pointing out that unemployment affects other countries too. The initial incident with the jobless university graduate that triggered the riots was understandable and regrettable, he said, but it had been exploited "by some sides who do not wish good to the homeland" and by "some foreign television channels which broadcast false and unchecked allegations and rely on dramatisation, fabrication and defamation hostile to Tunisia". He also threated to use the law "rigorously" against "a minority of extremists and agitators in the pay of others". Overall, it was the kind of speech that old-style Arab leaders typically make when they are in a corner and, in the absence of any real content, and despite his claims that the disturbances have been hyped by foreign media, its actual effect was to signal – unintentionally – to the entire Middle East that something serious is happening in Tunisia. 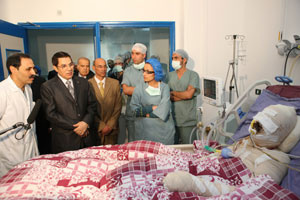 In a parallel public relations offensive yesterday, Ben Ali paid a hospital visit to Mohammed Bouazizi (the young fruit seller who set fire to himself), "enquiring about his health". A rather grotesque official photograph showed Bouazizi swathed in bandages like an Egyptian mummy. The president also met parents of Hassan Ben Salah Neji, the young man who electrocuted himself, and Mohamed Ammari, the teenager shot dead by police. Among other events yesterday, al-Jazeera reports that an anti-government rally in Gafsa was blocked by police. In Tunis, about 300 lawyers held a protest near the main government building and a high school trade union demonstrated outside the education ministry. Distribution of two opposition party newspapers, Tareeq al-Jadid and al-Mawqif, has reportedly been blocked because of their coverage of events in Sidi Bouzid. The Los Angeles Times has an interesting article by Lahcen Achy about Tunisia's economic policies and where they have gone wrong. "If it was happening in Iran instead of Tunisia, it would be on the front pages of all the newspapers." Complaints of this kind about coverage of the Tunisian uprising keep appearing on the internet – many of them suggesting that editors around the world are protecting Ben Ali's regime from criticism for political reasons. Politics may come into it here and there, but it's not by any means the main factor, as Octavia Nasr (formerly of CNN) explains on her blog. When the trouble broke out in Iran last year, there was already a lot of media interest. The opposition had been active for months and, when the election came, its outcome was uncertain (unlike elections in Tunisia). Journalists who had gone to Iran for the election were already on hand to report the protests that came in its aftermath. Tunisia, by contrast, is off the international news map and none of the media are geared up to cover it to any great extent. Also, while it's easy to see now that the trouble in Sidi Bouzid on December 18 marked the start of something much bigger, that was far from obvious at the time. I didn't hear about it myself until four days later when a report from Associated Press appeared on the Washington Post's website. When I first wrote about it on my blog, on December 24, it still looked like a very localised spot of bother: interesting, but hardly the kind of thing that would get news organisations scurrying to despatch reporters to the country. Incidents of this kind occur quite often, even in unexpected places, and usually they go quiet after a day or two. A similar thing had happened (for different reasons) in the Saudi city of Madina the previous week before fizzling out. It didn't really become clear until last weekend that the protests in Tunisia, far from fizzling out, were growing and spreading. Looking at it now, I think the Tunisian uprising is a very important event, potentially for the whole Middle East, not just Tunisia – though I woudn't have said that a week ago. At the same time, I can see why news organisations aren't pouring vast resources into covering it: there are too many obstacles on the ground and they are still uncertain about how long it will last. Some good-quality reporting would be nice, but I doubt that it's going to affect the outcome. Remember: despite all the media coverage of the Iranian protests, Ahmadinejad is still in power. What we should be much more concerned about at this stage is the flows of information within Tunisia. Considering all the restrictions imposed by the regime, how well are the protesters able to communicate with each other and co-ordinate their efforts? In his televised speech on Tuesday, President Ben Ali condemend the rioters and seemed to be urging Tunisians to make their point peacefully. "We reassert the need to respect freedom of opinion and of speech," he said. "We respect any position if it is expressed within the framework of law, the rules and dialogue." Here's a little story from last May, when a group of Tunisian activists wanted to take part in the worldwide day against internet censorship. They went to a police station, filled in the forms requesting permission to demonstrate – and were immediately detained by the police. One of them was then forced to record a video urging people not to turn up for the demonstration and to sign a document acknowledging that his call for a demonstration was "wrong". The Tunisian regime seems to be clutching at straws. Yesterday, the official news agency reported that six local organisations, including the Road Traffic Association and the Professional Association of Banks, have congratulated President Ben Ali on his recent speech. They allegedly think it "testified to an acute patriotic sense, a clear vision and a resolute commitment to forge ahead on the way of boosting comprehensive development throughout the country". Meanwhile, Ben Ali has sacked Mourad Ben Jalloul, governor of Sidi Bouzid (the area where the disturbances first broke out). No reason was given. On Wednesday, the president dismissed his communications minister, Oussama Romdhani, along with two other ministers, in a government reshuffle. Al-Jazeera yesterday reported the death of another protester. Chawki Belhoussine El Hadri, 44, died of his injuries after being shot by police in Menzel Bouzaiene on December 24. The Nawaat website has a summary (in French) of other protest-related events yesterday, plus some videos. There are calls for a general strike in Tunisia tomorrow (Monday), according to various posts on Twitter. Meanwhile, more and more videos are appearing on the nawaat blog showing protests around the country. I was particularly fascinated by one video showing a small but imaginative protest at an unlikely spot: Bab el-Assal metro station in the suburbs of Tunis last Tuesday. People can be seen on the platforms and railway lines, silently holding a hand over their mouth. A train approaches ringing its bell, but the demonstrators stand their ground and the train comes almost to a halt before they finally step aside. It's very reminiscent of that famous scene in Tiananmen Square where a lone individual challenged a Chinese tank. The other thing to note is that it all happened without any sign of a police presence. It seems to me that this sort of tactic could give the authorities quite a headache if adopted on a wider scale. Mohamed Bouazizi, the jobless young man who set fire to himself in Tunisia last month triggering a wave of anti-government demonstrations across the country, died of his injuries last night, according to a report on the nawaat website. Bouazizi, 26, was selling fruit and vegetables in the street to support his family when police stopped him for trading without a licence. An altercation followed in which one officer reportedly slapped him and spat at him. Bouazizi then doused himself in petrol and set himself alight. His action, on December 17, was seen as epitomising the plight of Tunisia's unemployed – especially the young – and protests, increasingly directed against the repressive regime of President Zine el Abidine Ben Ali, have continued ever since. A general strike has been called for today. At this point, several Tunisian government domains have been taken down completely, or have been severely crippled by the DDoS attacks. Included in the list of targets are pm.gov.tn, rcd.tn, benali.tn, carthage.tn, bvmt.com.tn, and ministeres.tn. Most of those taking part are said to be from Tunisia. 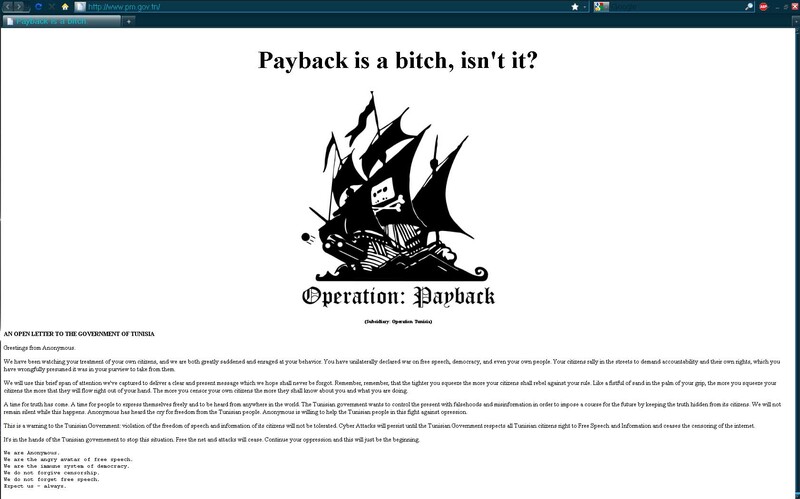 Screen grabs of the hacking are here, here and here. Zimbabwean government and the Church of Scientology. NOTE: Nawaat's report of Bouazizi's death turned out to be premature – but only by one day. He died on January 4. As the Tunisian uprising continues on the ground with no sign of abating, the battle over information is intensifying on the internet. Yesterday there were numerous reports of Tunisians' Facebook pages and email accounts being hacked – presumably by the regime – with Yahoo users apparently the most vulnerable. The nawaat website responded with technical guidance for protecting against attacks. 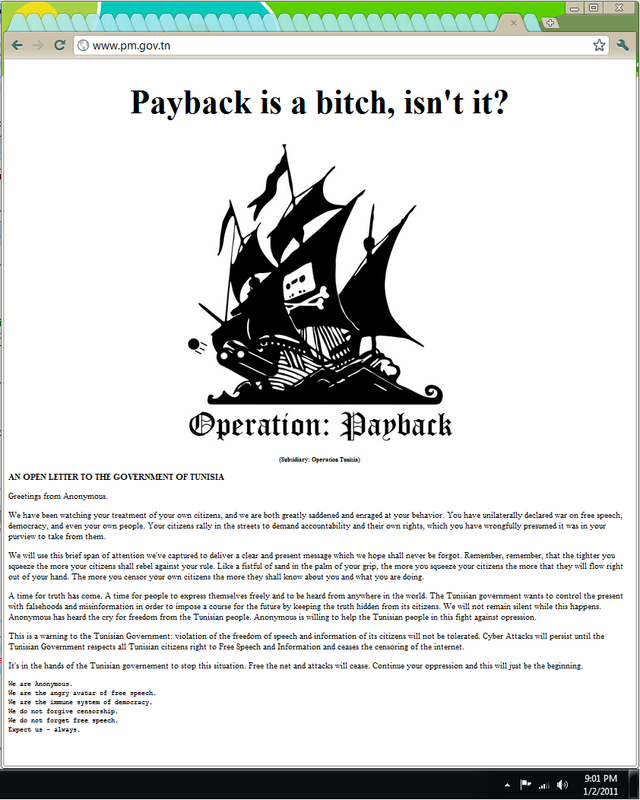 The Tunisian Pirate Party was also reported to be distributing USB sticks containing Tor (anonymity software) to students. The Tunisian government is regarded as a world leader in the field of internet censorship and it could easily block access to the whole of Facebook if it chose to do so. However, it seems to have recognised that this would be extremely unpopular and could further inflame the protests – so it has opted for targeting individuals who oppose the regime. The authorities also routinely block access to anything remotely critical which appears on websites outside the country. According to a Twitter user, this article was blocked within 10 minutes of appearing on a Swiss website. Parallel with the government's assault on internet users, the group known as Anonymous has been attacking government-related websites (as reported here yesterday). Al-Jazeera has more details. Al-Jazeera appears to be the only major news organisation trying to cover the uprising on a day-to-day basis and, predictably, it has come under fire from the Tunisian regime and its supporters. The accusations of "unprofessionalism" and using "unreliable" (ie non-governmental) sources are a bit rich considering that the authorities are doing their utmost to prevent it from reporting. It is having to make extensive use of amateur videos and social networking websites in order to get information. Twitter users reported demonstrations in several Tunsian cities yesterday, though details are scarce. The nawaat website posted videos of two student protests, one at the Institut de Presse et des Sciences de l'Information and the other at Gronbalya Lycée. It also reports a hunger strike by trade unionists in Redeyef. Lawyers have reportedly called a strike for Thursday, January 6. The Egyptian foreign minister arrived in Tunisia yesterday for two days of discussions on "key issues of mutual interest". The Palestinian prime minister, Mahmoud Abbas, also began an official visit. Where freedom of speech is not allowed, people still find ways to express their message. Students at an engineering institute in Tunis arranged themselves to spell out the words "tunus hurra" (Free Tunisia) on Monday. Schools and colleges in the capital had been surrounded by security forces to prevent students from demonstrating on the streets. As classes resumed after winter vacation Monday, hundreds of high school students and other protesters clashed with police, who used tear gas, said a union official who was present. The man spoke on condition of anonymity, fearing problems in a country where the media is heavily controlled by the state. Amid the clashes, demonstrators set fire to tires and to the local ruling party headquarters on Monday, the official said. The unrest continued on Tuesday. Several people were arrested, and others were hospitalized with injuries, the union official said. The protests shuttered local schools. France's LCI television broadcast video of Thala that showed packs of shouting young men roaming the streets and clouds of smoke in the air. Al-Jazeera has a round-up of recent events here. It has also set up a special web page headed "Trouble in Tunisia" which compiles all its recent recent reports, along with an interactive map showing where the protests are occurring. The nawaat blog continues to provide videos and reports of each day's events, and crowdvoice.org is compiling articles from a variety of sources. "Sensitive social and political topics were already heavily censored on the Internet but the authorities, who are clearly disturbed by this wave of unrest, have responded by trying to impose even tighter and faster controls over the online flow of information about it. "However, in the internet era, it is becoming impossible to prevent coverage of events of this scale and censorship has perverse effects. All sorts of rumours circulate in the absence of reliable information. We urge the authorities to back off and to stop filtering websites and stop intimidating netizens and bloggers." Q. How do you say "Imelda Marcos" in Arabic? It is three weeks today since Mohamed Bouazizi lit the flame in Tunisia. How are we to regard the events since then? How should we characterise them? Writing for the Guardian last week, I used the word "uprising", though I can't say I gave it a lot of thought at the time. Based on what I knew then, "uprising" seemed the obvious choice – and it still does if you need to boil it all down to a single word. Yesterday, writing for Le Temps, French journalist Christophe Ayad gave a slightly longer description: "Pas encore une révolution, mais plus qu’une révolte" (Not yet a revolution but more than a revolt.) That, too, seems a fair summary. But note the "not yet" bit. What we are seeing now may not be a revolution in itself, but its precursor. Personally, I do think a revolution of sorts is coming and will be surprised if the Ben Ali regime is still in place two or three years hence – for the simple reason that it's incapable of adapting. The protesters' grievances cannot be addressed in any meaningful way while it remains in power, and the clear message from the Tunisian people is that they have had enough. This may seem a difficult point for the world outside to grasp – especially the Americans. How do the events in Tunisia mesh with the "forward strategy of freedom" (militarised and heavily overlaid with international politics) that George Bush used to talk about? They don't – and that's their beauty. Also, Tunisia isn't a case of Tsvangirai versus Mugabe, Yushchenko versus Yanukovych or Ouattara versus Gbagbo. Organised political parties are irrelevant here, as they are these days in most of the Arab world. Nor is there a charismatic figure that the media can easily latch on to, like Aung San Suu Kyi in Burma or Lech Walesa in the Polish shipyards. In that respect, Tunisia 2011 looks more like Paris 1968, with a random assortment of students and trade unionists in the vanguard plus – to bring it up right to date – a collection of Twitterers, Facebook users and tech-savvy cyber warriors. Will it be suppressed like Paris 1968? Somehow, I doubt it. For one thing, the protests are more widespread and the grievances more deeply felt. Others are less sanguine about that. On the Arabist blog, Issandr El Amrani suggests Ben Ali is unlikely to be dislodged without a strong diplomatic push from the EU, and he quotes several articles that are considerably more sceptical than I am. Why Obama has to be brought into it, I haven't the faintest idea. The Tunisian protesters aren't doing it for Obama's sake and as far as I'm concerned the longer he keeps his nose out, the better. American support at this stage is more likely to hinder than help, though I wouldn't object to a final nudge from the White House when Ben Ali is on the brink of toppling. But, setting Obama aside, consider the idea of an Arab Spring. The sentiments and long pent-up frustrations expressed by Tunisians during the last three weeks are shared, to a very large extent, by Arabs throughout the Middle East. They complain endlessly amongst themselves – and yet they feel there is little, if anything, they can do about it. The Tunisian uprising is beginning to change that. It is giving Arabs a glimpse of possibilities that were unimaginable just a month ago. It is profoundly empowering and its psychological effects are not to be underestimated. It is the opposite of the gloom that settled over the Arab world from 1967 onwards and may prove to be no less important. Could this mean that we are about to see the crumbling of Arab regimes, one after another, as happened in Eastern Europe? In the short term, probably not. But suppose – and this is by no means an implausible scenario – that as resistance in Tunisia continues the regime's support gradually ebbs away, until eventually Ben Ali's position becomes untenable. Elections follow and the country emerges as a sort of East European style democracy (or better, Latin American style): far from ideal, but something that can be built upon. That would be significant for the whole region: regime change of the home-grown variety, not imposed from outside in the way that Iraq was, or from above to give an existing regime the appearance of legitimacy. It would be something unique in the Arab Middle East: democracy by popular demand. But could it be replicated in other Arab countries? That is a more difficult question. 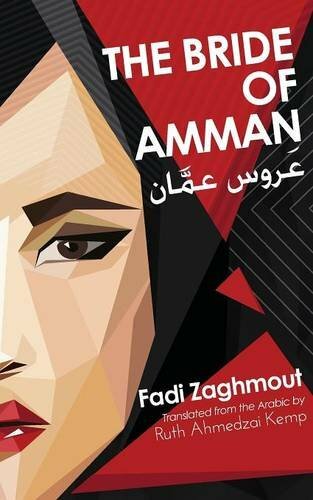 To a greater or lesser degree, all the Arab regimes present similar problems: a lack of legitimacy, a lack of accountability and transparency, corruption, authoritarianism and elderly leaders (for the most part) governing a frustrated, youthful population. Some of the regimes, though, are more resilient than others. While it's tempting to suggest that Egypt could be next – the Mubarak era is plainly coming to an end – the regime itself, unpopular though it is, does have an extensive patronage base that may be enough to keep it in power for some years yet. And the same could be said of several other countries. The Tunisian regime, on the other hand, looks especially vulnerable because it has relied so heavily on fear and repression as mechanisms for control. Other Arab regimes do that too, but they also have more subtle and diverse weapons in their armoury. 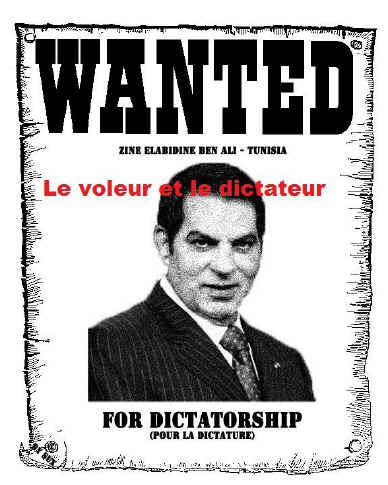 Once the fear barrier is broken in Tunisia though (as seems to be happening), there is little left to protect Ben Ali. So, I don't expect Tunisia alone to bring down the entire Arab house of cards. What it will do is intensify the pressure for change that exists already in other countries and encourage people to look to themselves, rather than outside, for solutions. It will also help dispel the idea that the long-surviving regimes we see in place today are permanent fixtures. They are not, and one day they will be history. 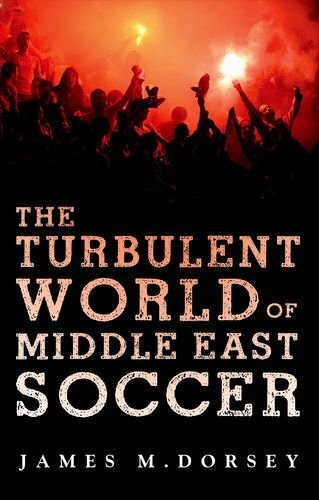 We’re certainly watching what’s happening both in Tunisia and Algeria with a great deal of interest. We did call in the Tunisian ambassador yesterday and expressed our concern about both what is happening with regard to the demonstrations and encouraged the Tunisian Government to ensure that civil liberties are protected, including the freedom to peacefully assemble. We also raised the issue of Tunisian – what looks like Tunisian Government interference with the internet, most notably Facebook accounts. Frankly speaking, we’re quite concerned about this and we’re looking at the best and most effective way to respond and to get the result we want. In Algeria – this is something I actually watched with a great deal of personal interest having served there as ambassador for three years – it’s frankly too soon to tell exactly what is happening here. There have been, as you are well aware, price increases as well as an acute housing shortage, which have not been well-managed by the government. And as a result, people are taking to the streets. We understand that there was some additional demonstration and rioting today. We don’t know the extent of it. But we’re also looking there about what’s the most effective and immediate thing to say and do. Regarding the summoning of the Tunisian ambassador, a spokesman said the State Department had raised "concerns about the ability of the people of Tunisia to exercise their rights and freedom of expression and freedom of assembly." It had also urged "restraint on all sides". Many people will no doubt be relieved that the US has finally spoken. But, as I have argued here before, the Obama Administration has to be careful. Strong American support for the protesters could by used by the regime to discredit them. However, there are other things that outsiders might do to put pressure on the regime. Tunisia's economy depends heavily on tourism – it's a popular holiday destination for Europeans. A non-governmental boycott campaign focusing on tourism would be a good start. In Tunisia itself, the authorities have made a serious public relations blunder by arresting Hamada Ben-Amor ("The General"), a well-known rapper, who had released a song entitled "President, your people are dying". Around 30 plainclothes police turned up at his house on Thursday night to take the 22-year-old singer away. This generated more than 60 news stories in the world's media about his arrest (many of which also went on to talk more generally about the uprising). The result was exactly what the authorities have been seeking to avoid – far more international attention directed towards Tunisia than on any single day since the trouble began. Several bloggers are also reported to have been arrested. Public demonstrations around the country appear to have intensified yesterday – not entirely surprising, since it was a Friday (the Muslim weekend). The Los Angeles Times has a fairly detailed summary of recent events, compiled from Beirut. There is still virtually no reporting on the ground by journalists in Tunisia; a reporter from Le Monde was refused entry yesterday. Meanwhile, the Anonymous News Network has issued a video filmed secretly from inside a car. It is said to show a military convoy heading into Thala (western Tunisia) as police buses move out. A tank can be clearly seen on the back of one of the trucks. The implication behind this is that the military could be taking over from the police in some areas. However, there was also a claim on Twitter yesterday (and consequently difficult to verify) that the army chief, Rachid Ammar, was refusing to let the military be used in suppressing the uprising. AFP and al-Jazeera have reports on the riots in Algeria. There are some parallels with Tunisia – the rioters are protesting against high prices and unemployment – though whether the disturbances will continue and spread, as they did in Tunisia, remains to be seen. Below: another of The General's songs. UPDATE, 10 January: Hamada Ben-Amor's family stated that he was released after three days. The Tunisian regime has responded to American calls for restraint ... with live bullets. A number of protesters were shot dead last night – possibly 10 or more. Most reports attribute the shootings to the police, though the army has now been deployed some areas – allegedly to protect government buildings. The increasing use of live ammunition may be a measure of the Ben Ali regime's desperation at its inability to control the disturbances sweeping the country. Al-Jazeera reports that in Thala (Kasserine province, near the Algerian border), four people were killed when police opened fire after first using water cannons to try to disperse a crowd throwing stones and petrol bombs. A government building had been set on fire. The nawaat website shows some gruesome scenes from last night's events in Thala, including the picture above. There was also trouble yesterday in the city of Kasserine. Reports on the internet named four people as having been killed there: Mounir Mbarki, Raouf Bouzidi, Saleh Fridhi and Mohamed Asswadi. According to AFP, a 12-year-old child died in Kasserine when shot in the head. In Meknassy (Sidi Bouzid province), two people – Chihab Alibi and Youssef Fitouri – were shot dead, according to a note posted on Twitter. Tunisia's main trade union, the UGTT (which is normally regarded as close to the government) now appears to have swung its weight behind the protesters. "We support the demands of the people in Sidi Bouzid and interior regions ... The UGTT cannot but be with this region, behind those in need and demanding jobs. "It is against nature to condemn this movement, it is not normal to respond with bullets." AFP quotes an opposition economist as saying that by doing this the UGTT is "making a great about-turn". We now have the unprecedented situation of major civil disturbances in two neighbouring Arab countries, both of them arising for similar reasons. On its own, the trouble in Algeria might not be a particular cause for concern (or celebration, depending on how you look at it). Algeria, after all, has witnessed plenty of violent strife in the past and I wouldn't yet go so far as to characterise the events there (unlike those in Tunisia) as a popular uprising against the regime. But with large-scale riots and demonstrations now happening simultaneously in two countries side by side, we are moving into uncharted territory. There are signs that the protests in both countries are starting to inspire and sustain those in the other – which could make them far more difficult for the authorities to quell. It's all looking much more serious than a week ago. Anything could happen now. And maybe it will. A quick update. Al-Jazeera and AFP are reporting that at least 20 people have died in the clashes in two Tunisian cities during the last 24 hours. Citing trade union sources, al-Jazeera says six were killed in Thala and a further 14 elsewhere in the Kasserine region. 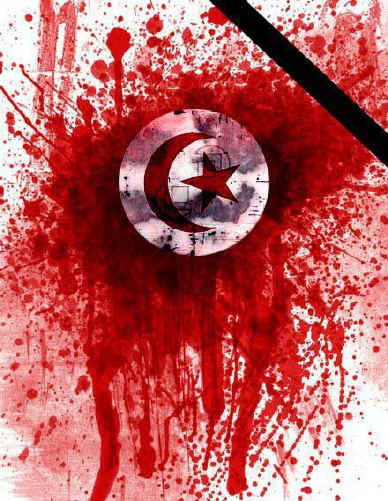 The Tunisian Kalima website says more than 50 have died, including 22 in Kasserine, 16 in Thala, eight in Reguab, two in Meknassi and one in Feriana. The Tunisian regime initially claimed only two people died. This later increased to five and it is now admitting to eight. The nawaat website has posted a video which it says shows scenes in the hospital at Thala. The Tunisian uprising is beginning to get more coverage in the English-language media, so this may be a suitable moment to look at the sort of coverage it is getting. Considering the horrific violence meted out by the police over the weekend, the Ben Ali regime is being given an extraordinarily easy ride. The Chicago Tribune, along with numerous other papers, carries a report from the Associated Press which refers to "rioting to protest joblessness and other social ills". Apart from a reference to "mobs" attacking an office of the ruling party, there is no indication that this "unrest" (as AP puts it) might have a wider political context beyond "unemployment and social ills" – not even a single line about the repressive nature of the Ben Ali regime. From the report, you would also imagine there is nothing but rioting – no mention of the very many peaceful protests (or the authorities' way of dealing with them). Protesters say they are angry about a lack of jobs, but officials say the rioting is the work of a minority of violent extremists intent on damaging Tunisia. Officials said the police had fired only in self-defense when violent crowds attacked, ignoring warning shots. The government said in a statement that the police were "doing nothing more than carrying out their legal and legitimate mission to maintain order and guarantee the safety and liberty of citizens". "President Ben Ali has said the violent protests are unacceptable and could discourage investors and tourists, who provide a large part of the country’s revenues. The authorities say they had responded to the protesters’ grievances by starting a program with employers to provide jobs for 50,000 unemployed graduates. "Tunisia has recorded strong economic growth in the past decade, but it has not been fast enough to satisfy demand for jobs. Unemployment is particularly acute among the young in the interior of the country." In one report, the BBC talks about "protests over rising food prices and unemployment in Tunisia" and adds: "The government says those responsible are extremists intent on destabilising the country." "Demonstrations are rare in Tunisia, where there are tight controls aimed at preventing dissent. The unrest has been linked to frustrations with the president and the ruling elite." "The protests against unemployment and lack of investment have lasted nearly a month. The authorities say the rioting is the work of a minority of extremists. President Ben Ali has said the protests are unacceptable." The Tunisian regime was fighting for survival yesterday. Reports and videos of clashes between police and demonstrators circulated on the internet throughout the day – so many that it became difficult to keep track. In some of them civilians were shot and killed – though at this stage it is impossible to even guess at the numbers. Perhaps most telling were the scenes, reminiscent of the fall of Saddam Hussein, where pictures of President Ben Ali were openly destroyed in the streets (two examples here and here). The EU issued a statement echoing that of the United States, calling for "restraint in the use of force and for the respect of fundamental freedoms", as did the UN secretary-general, Ban Ki-moon. At 4pm local time, Ben Ali appeared on television and on this occasion his speech was not interrupted by a telephone call. It's a subjective assessment, but I felt from his demeanour that he looked more than a little rattled. Unlike his speech two weeks ago, where he was seated presidentially behind a gigantic desk, this time he decided to stand – as if ready to dash out of the room at a moment's notice. He began with some familiar bluster, deriding (and insulting) the thousands of protesters by blaming "hostile elements in the pay of foreigners, who have sold their souls to extremism and terrorism, manipulated from outside the country". This was so obviously untrue that, from then on, most of his audience probably stopped listening. He followed this up with an implausible-sounding promise to create 300,000 new jobs within two years, and to hold a "national conference" next month (which nobody apart from the regime's most diehard supporters is likely to attend). Clutching weakly for other things to offer, he announced "a new impetus to regional newspapers devoting space daily to all governorates of the country" and said the "people's representatives" would be asked to "intensify their periodic contacts with citizens". He ended, very oddly, by thanking his "dear brother", Colonel Gadafy, for support and appeared to suggest that anyone who is unhappy with life in Tunisia should go to Libya. The situation must be truly dire if the only world leader you can publicly thank for support is Gadafy. Following his speech, in which Ben Ali also lectured Tunisians on the importance the regime attaches to education, the education ministry demonstrated the regime's commitment by announcing that schools and universities would be closed until further notice. Reports on Twitter overnight say access to Facebook within Tunisia has now been blocked in its entirety. Previously the regime had been blocking individual Facebook pages. If true, this is another blunder. Not only will it stir up further anger among Tunisia's youth; it will also be seen as a direct snub to the US, the EU and the UN, who have all made a specific point about the need for free expression. Maybe the next step is martial law but, as of yesterday, all the signs point to the regime losing control. More civilian deaths mean more funerals, and more funerals mean more protests. And keeping kids out of school, without even Facebook to keep them occupied, is also a recipe for trouble. Maybe Ben Ali will continue urging his security forces to redouble their efforts, but cooler heads in the police and army ought to be telling him (if they are not doing so already) that there is now only one action that can quell the riots: the departure of Ben Ali himself. Latest videos: Police attack demonstrators outside union building in Sfax; early morning incident in the centre of Bizerte; protest in Ben Guerdane. Tunisian stock market falls again, to lowest since last May. Biggest trade union, UGTT, calls for general strike; date to be confirmed. Several pictures on internet of police armed with Steyr AUG guns (made in Austria). Continuing reports of a heavy death toll in Kasserine. As many as 50, according to some sources. Several reports on Twitter of undercover regime supporters looting and being filmed by police – presumably to discredit protesters. Heavy police presence in Tunis. Shops, etc, closed in Avenue Bourguiba. Group of lawyers beaten up while preparing to hold a peaceful protest. Ditto, a group of 100 actors, musicians and artists trying to do a flashmob. Rumours of a curfew in Tunis from 7pm tonight. Facebook access reportedly returns after a five-hour break. Police visit cafes in Tunis suburbs, ordering owners not to show al-Jazeera on the TV. Radio Kalima journalist Nizar Ben Hassen arrested at his home in Chebba. Quote from Vincent Geisser, author of "Dictateurs en sursis", in the French newspaper, Libération: "The White House is well aware today that the Ben Ali regime is finished. The Americans are seeking second or third man, capable of succeeding him. The United States would not necessarily be opposed to an 'orange revolution' in Tunisia. 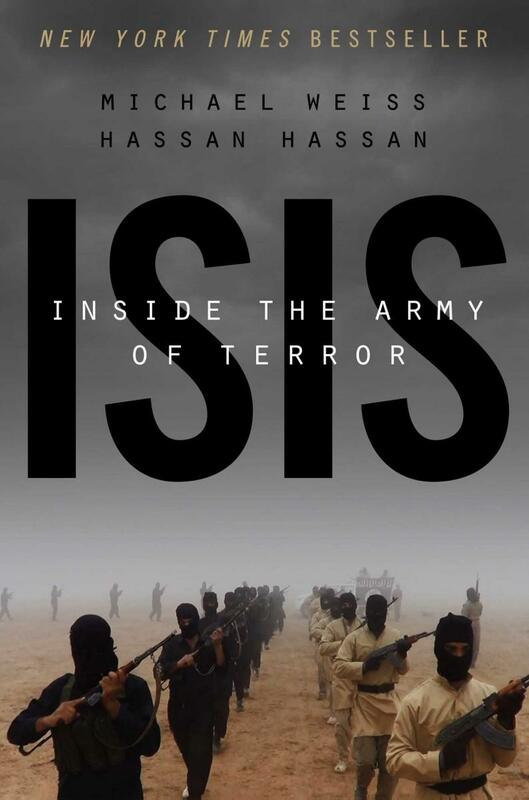 It is precisely for this scenario from the State Department is working." Statement from William Hague, Britain's Foreign Secretary: "I condemn the violence in Tunisia and the deaths of protestors and regret today’s announcement of the closure of all national schools and universities across the country. I call on the Tunisian authorities to take steps to resolve this situation peacefully and without further violence with a commitment to respect the right to peaceful protest. I also call on the authorities to provide due and transparent process to those who have been detained." I have spent a lot of time over the last few days following the Tunisian uprising on Twitter. 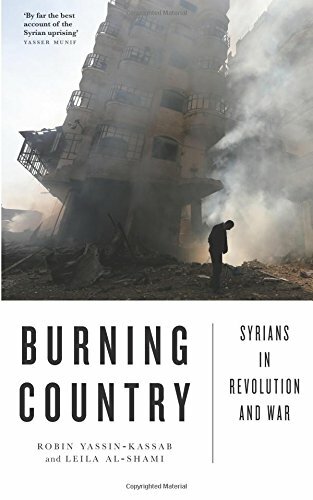 With reporting on the ground severely curtailed by the authorities, with the western media slow to catch on to the significance of the events, and the Arab media – with a few rare exceptions such as al-Jazeera – nervously wondering what they cansafely say, Twitter has become the first port of call for information. The regime is clinging on and making some minor concessions which are probably far too late. The security crackdown is obviously placing huge demands on the police and military. In a trial of strength, can the protesters stretch them to breaking point? Maybe the endgame is approaching but the big question is how it can be brought to a conclusion. Interior minister, Rafik Belhaj Kacem, dismissed; replaced by Ahmed Fria, former communications minister. Prime minister announces release [not confirmed] of all those arrested during recent events except those involved in looting and burning. President sets up committee of inquiry into abuses during recent events, plus a second committee to look into corruption (!) and mistakes by some officials. Both houses of parliament to meet Thursday to discuss (surely, "approve") president's decisions. Massive demonstration in Sfax, followed by tear gas. Hatem Bettahar, assistant professor (said to be a French citizen) shot dead – apparently by a government sniper in Douz. Protests in Hammamet (important tourist destination). One or more dead; police station burned. Ruling party headquarters in Dar Chaabane (Nabeul) on fire. Army increasingly visible on the streets of Tunis and other cities. President Ben Ali should have created 810 new jobs by now, in line with Monday's promise of an extra 300,000 jobs over two years. Hamma Hammami, Communist Party spokesman, arrested. Former political prisoner Lamari Ahmed arrested. Abdelwahhab Maatar, lawyer for rapper El Général, reportedly arrested. Headquarters of ruling party in Sfax said to be on fire. Curfew declared in Tunis and suburbs from 8pm tonight until 5.30am tomorrow. Air France/KLM cancel late-night flight from Paris to Tunis. Some of presidential family reportedly arrive in Canada. Today is exactly four weeks since the start of the Tunisian uprising and I was planning to write another summary of the day's main events. But, honestly, I can't. There's so much going on, so much chaos. Let me just point to two things which, basically, say it all. One was the demonstration today in Kairouan. I've been there on holiday and it's not an especially big town. But look at the video: that protest is huge, huge, huge. The police on Thursday all but abandoned this exclusive Mediterranean beach town — haven to the capital’s rich and powerful — as rioters calling for the ouster of Tunisia’s authoritarian president swarmed the streets, torched bank offices and ransacked a mansion belonging to one of his relatives. That is not the only place where the security forces are fighting a losing battle. Regional commanders are no doubt bracing themselves to deliver the bad news to President Ben Ali if they haven't already done so: they can no longer cope and the only way to restore order now is through a political solution. Ben Ali is speaking as I write this. In any normal country it would have been his resignation speech. Instead, he has promised to stand down in 2014, but the thought in many Tunisians' minds must surely be: why wait till then? In the meantime, he seems to be offering a bit more freedom and promising to stop shooting demonstrators. But even that seems too late now and, anyway, after 23 years of repression who is going to take him at his word? The Muslim weekend is upon us and, I suspect, many Tunisians will judge that this is the moment to finish him off. Unless the president has some totally unexpected tricks up his sleeve (which I doubt), he'll be gone well before 2014. If the protests continue on the same scale this weekend, I'd give him about three days. 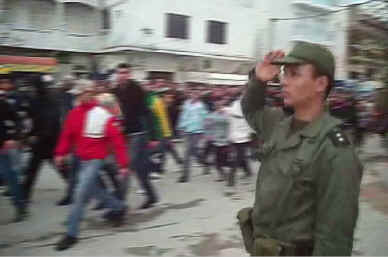 A Tunisian officer salutes the funeral of one of the protests' victims. Bizerte, Thursday. Source: nawaat. In his speech to Tunisians last night, President Ben Ali went for double or quits. Either he has done enough to quell the protests with his offers to stand down in three years, to allow more freedom of expression (with qualifications) and to stop shooting demonstrators (again, with qualifications) or the game is lost. If it fails, he has only one card left: resignation. Last night, drivers in Tunis could be heard hooting their horns in apparent approval of the president – though there were claims on Twitter that this was not spontaneous but orchestrated by the regime. On the plus side, internet censorship appeared to have been lifted, largely if not totally. On the minus side, there were reports of further shooting, even after the president had ordered it to stop. This morning, the UGTT (the main trade union) is due to hold a general strike and demonstration in Tunis. It is expected that the ruling party will organise a counter-demonstration and the result could easily be a massive punch-up. A BBC report says the "opposition" has (cautiously) welcomed the president's promises but opposition politicians are not the same as the protesters on the streets who may well have other ideas. Pledges, even when they are made on television, don't count for much in the Arab countries and ordinary folk treat them very cynically. But let's suppose, for the sake of argument, that Ben Ali survives this weekend and buys some more time. What then? First, Tunisia will not revert to what it was. People will be far more outspoken, less inhibited than they were before. The mainstream media may not change much (after all, some of them are owned by Ben Ali's family) but politics will have to open up. That, in turn, means more danger for Ben Ali. He will obviously try to use the time he has bought to prepare the way for a successor of his own choosing, but it won't be plain sailing. He has made economic promises that he can't deliver and that could blow the whole thing off course. Meanwhile, there is other unfinished business: calls for inquiries into the shootings, for example, and the promised investigation into corruption. Corruption is a major flashpoint, because there is no way it can be tackled credibly without arresting most of Ben Ali's family. If he does survive the current uprising his future still looks pretty bleak. At best, he will be what we in the west call a lame duck leader – not at all what the situation demands. At present, though, all that is still hypothetical. Which way it is going to go will be decided on the streets over the next few days. The ball is back in the protesters' court. In due course, every city of consequence in Tunisia will have a street or square named after Mohamed Bouazizi, the unemployed fruit-seller whose humiliation at the hands of the authorities led to a revolution. It's sad that he didn't live to see it but today's events are a fitting tribute. It is still unclear what the future may hold for Tunisia but we can be sure that whoever takes over will have to listen far more to the voice of the people or risk the same fate as Ben Ali. On January 7 – only a week ago, but it seems such a long time now – I discussed what impact a Tunisian revolution might have on the wider Arab world. Regardless of what happens next in terms of a Tunisian government, the inescapable fact is that a popular uprising has removed an Arab head of state – a truly historic event. Ben Ali has fled and he is not going to return, despite what anyone may say about whether he has formally resigned or not. That alone is going to have a huge psychological impact throughout the region. As several people have pointed out on Twitter, while Obama says "Yes, we can", the Tunisians have said "Yes, we do." Looking around the other Arab regimes, I can't see any of them (with the possible exception of Algeria) at risk of being toppled in the quite same way – at least, not in the immediate future. There are so many differences in the circumstances. But – and it's a very important "but" – we can expect Arab publics to become increasingly assertive while the regimes become increasingly nervous. For the regimes, though, in the long run it's a lose-lose situation. Either they can seek to tighten their control, thus fuelling popular disaffection, or they can relax their control – which the public will duly interpret as a sign of weakness and seek to exploit. One way or another, they are going to sink deeper into the mire. 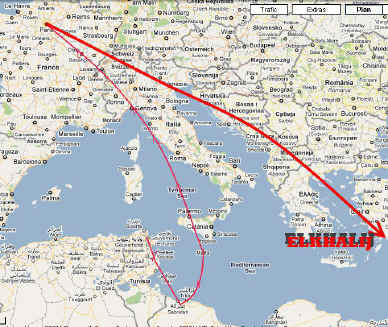 After fleeing Tunisia yesterday, Zine el Abidine Ben Ali made a circuitous journey around the Mediterranean. His plane first headed south to Libya, then north towards Paris where he was apparently told he would not be welcome. After a reported refuelling stop in Italy, the plane eventually landed in Jeddah, Saudi Arabia, where Ben Ali is now a guest of the Guardian of the Two Holy Shrines, His Majesty King Abdullah. Whether the king will offer him a long-term home there remains to be seen, though it's perhaps worth recalling that Saudi Arabia gave permanent refuge to the Ugandan dictator, Idi Amin, after he was deposed in 1979. A statement from the official Saudi Press Agency said: "We have welcomed in the Saudi kingdom the arrival of President Zine El Abidine Ben Ali and his family." Note the reference here to Ben Ali as "president". Legally speaking, this is correct, because there has been no announcement of his resignation. He has fled the country but he is still, technically, head of state. This has an important bearing on what may happen next inside Tunisia. For the sake of legitimacy during the transition, it's desirable to follow the letter of the constitution – which is what Ben Ali did when he seized power in 1987. Very shortly after being appointed as prime minister, he had President Bourguiba declared medically unfit for office and became acting president himself, as specified in the constitution. There are two different provisions in the Tunisian constitution: one to cover the president's "temporary disability" (Article 56), and the other for a vacancy caused by the president's "death, resignation or total incapacity" (Article 57). Ben Ali's departure is being treated as a case of "temporary disability" – which is probably why prime minister Mohammed Ghannouchi has been cagey about saying whether or not he will return. In these circumstances, Ghannouchi legally assumes the duties of president, but with two important caveats: he cannot dissolve parliament and the existing government must remain in place until the end of the president's "disability". Interestingly, Ben Ali dismissed the entire government (with the apparent exception of Ghannouchi) before leaving – so the rule about the government remaining in place doesn't strictly apply. This has opened the way for Ghannouchi – if he so chooses – to form a government of national unity that includes opposition politicians. If Ben Ali had opted for the alternative course – immediate resignation – the chairman of parliament, not Ghannouchi, would have become acting president. However, that course also requires the holding of new presidential elections within 45-60 days (something even the opposition would probably not want, since it allows them little time to organise, especially during the present chaos). Ghannouchi, 69, is not a popular figure. He has been prime minister since 1999 and is regarded as one of Ben Ali's long-term henchmen. Not surprisingly, there is talk among the Tunisian protesters of trying to oust him too. If they succeed, the constitutional position will become very murky indeed. There doesn't seem to be an ideal solution but, if constitutionality is to be observed, a broadly-based and short-lived transitional government under Ghannnouchi (regrettably) may be the least bad option – assuming that Ben Ali can be persuaded to resign shortly, triggering a presidential election in, say, April or May. That would allow Tunisians to choose a new leader without letting Ghannouchi become too entrenched. When – and if – Ben Ali announces his resignation, Ghannouchi must cease to be acting president (at least, according to the constitution)..
On the other hand, there's a nightmare scenario where Ben Ali could refuse to resign and sit out the rest of his term in Saudi Arabia until October 2014. That would give Ghannouchi almost four years to consolidate his position – and it may be what Ben Ali has in mind. Having Ben Ali as a guest also gives King Abdullah an opportunity to manipulate Tunisian politics behind the scenes. He could, for instance, insist on Ben Ali resigning as a condition for staying in the kingdom or, alternatively, he could continue to protect and honour him as a "president-in-exile". has now decided that the chairman of parliament, Fouad Mebazaa, should be acting president – and not prime minister Mohamed Ghannouchi. The council says that Article 57 of the constitution, rather than Article 56, should apply. In other words, Ben Ali is deemed to have given up the presidency permanently rather than temporarily. It also means that presidential elections must be held within 60 days. This is much better news.